The remains of the fire at Turning Basin, Port Kaituma. Fire early Tuesday morning ripped through a house and a nearby fuel tank at Turning Basin, Port Kaituma, sources said. No one was injured in the fire that started at about 4:30 AM. The cause of the blaze was not immediately known, although there is some suspicion that it might have been the work of arsonists. 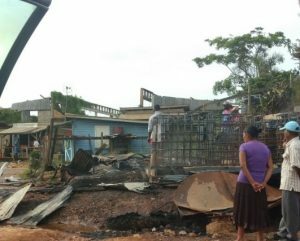 Chairwoman of the Neighbourhood Democratic Council, Margaret Lambert told Demerara Waves Online News that she knew nothing much about the origin of the fire. Lambert said she was told that the fire started in an unoccupied house and then spread to the nearby fuel tank, resulting in a loud explosion. The fuel tank is owned by Brian Gammel. Fuel is normally purchased from neighbouring Venezuela and brought to Guyana for sale to residents and gold miners.